For four weeks I have been in protection mode. I have cradled my broken limb in a splint, in a sling, and in my mind, as I carefully walk through my day. I have done this as if convinced I could bring about healing. I even winced my way off of four planes assuming a false hope that flinching could prevent overhead bin luggage from smacking into my arm. Now, we are five weeks after the injury and four weeks after the surgery. The bone is healed and held firmly in its place by a plate and screws. The arm, however, is another story. I lovingly refer to it as Frankenarm. I can feel it, move it some, and it is connected to my shoulder, but I barely recognize it as mine. The arm is thin with weak muscles. The hand and wrist unrecognizable due to swelling. Thick layers of skin, denied the natural privilege of shedding, now buckle and flake creating little piles of foreign matter every place my arm occupies. The results of five weeks of protection, five weeks of inactivity, are stunning. I apply heat treatment to the wrist to loosen things up for stretching and then follow that with a cold pack to reduce swelling in my fingers. My blood doesn’t know if it should run hot or cold. My day is still left-handed because the fingers on my right hand are useless, but, I have to continually remind myself to move that arm, as if it works, so I can exercise muscles that no longer pay attention to automatic messages from the brain. For four weeks I have been in protection mode. Now I need to change from protect to push. Yesterday was day one for Frankenarm. I spent the day extending the arm at the elbow so that my fingers no longer yearn for the comfortable spot over my abdomen. Today, I press against the wall to straighten my fingers and practice turning my hand palms up. I need to accomplish this before I can complete the exercises and stretches that will return my arm to a useful state. The road to being able to type my dissertation looks so long I have taken to hiding chocolate so as to ensure an ample supply. Desperate situations call for desperate measures. Now I wonder if I perform similar protection rituals with my faith? Have I wrapped it in my Bible and held it close to my chest? When I am faithful in Scripture, Sacraments, and Worship, my faith is fed, much like my arm. But, what happens to a faith that goes unused? What happens to a faith that doesn’t see work? For weeks my arm has had everything it needs except for work. When not exposed to the air it could not shed old skin. While held still in one position the bones were allowed to heal but the muscles began to die. Lack of activity allowed fluids to gather in my fingers which only proved to encourage less activity. Now my previously busy arm is pretty much useless. 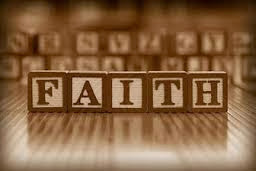 When I protect my faith by refusing to expose it to different life perspectives, I risk my faith by replacing it with nothing but my own thoughts and feelings. I need to read and listen to other perspectives and compare them, along with my own, to the truth offered by scripture. When I protect my faith by refusing to expose it to new people who yearn for the promise of God’s Word I risk losing that faith as it dies layer by layer. Judging others for their lack of faith and for their life circumstances is as harmful as neglecting to use my muscles. Soon, I will find I cannot access a faith that is wrapped in useless tissue. I broke my arm and was blessed by surgery, and the talented work of the medical staff. I was further blessed by the care of family and friends. I have my arm back and this reminds me that God is good. I have much work to do before my arm is useful and that reminds me that God is good all the time. May God send a measure of His spirit to remind us good works can never save us, that the Word and Sacraments give our faith life, that worship reminds us of our standing with God, and that He designed our faith to be used; to be pushed and not protected. Amen, Kim! Keep working on those exercises. They are difficult and sometimes painful but they will ensure you regain full use of your arm. My prayers for your healing and patience continue.